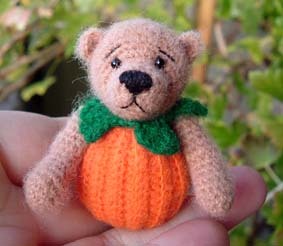 Anyone here creating the little mini bears ...well, say any small size ? I just started recently making these out of various sizes of threads...it is addicting. It would be fun to get some feed back on what kind of thread/ yarn you have tried, joints used and eye sizes...plus a little file for photos of our creations . there was some talk earlier about this but nothing came of it. 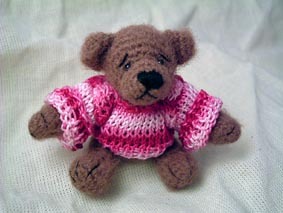 I like to occasionally make crochet bears as well and wouldn't mind a separate index for that category. Of course you know that Debi of Teds from Threads is a member and her site has a very good supply of all the ingredients needed for crochet critters. Hi Marion...I play on the site TedThreads, they do share tips but mostly they share photos. But I hope to do more! If you don't know what punch thread is... it's almost like a mini baby yarn. Lots of folks make gorgeous whole bears out of this thread as well! Oh.... as many of you know, I started out with making bears from thread.... wanna hear something funny.... the very first bear I ever made, and I mean the FIRST.... 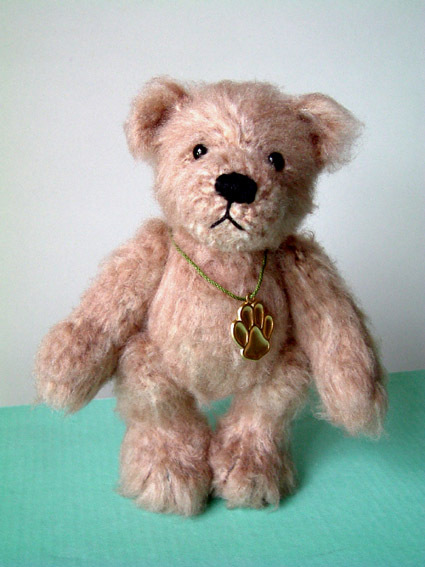 I've shown you all pics of my first mohair bear, my first mini.... but my first bear ever... is in the February 2004 issue of Teddy Bear & Friends. I don't have a pic that I can find on my computer, but those of you who save old TB&F issues should have a peek if it's handy! I made this tiny little bee bear... he's fairly atrocious! 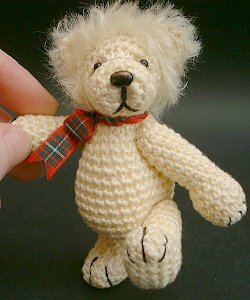 I had bought the TB&F that had Berta Hesen Mentin's lovely crocheted bears in it, and thought... oh, I can do this! In that issue they had asked for photos of other crochted bears for an upcomming issue... so I sat down and churned that little guy out, took a photo with my camera, and the rest is history! I STILL can't believe that they printed that pic! I make crochet (and knit) bears. You can find my latest design Kameko in Japanese style in the Showcase forum. There are some great Yahoo groups on this topic. My favourite thread is punch thread, because it doesn't slip off the hook as easily as perle cotton and it can be brushed. I believe Sandi prefers angora. Its really a matter of taste. I'm not sure we need a separate forum, but would be happy to discuss the subject. Bedtime for me, talk more tomorrow. ok but you know we are getting pretty big here at TeddyTalk. Would you guys think that maybe we could combine Mini bears and string bears? I have been missing the for sale forum just because of how big we are getting....and I think it is great how well TT is doing and its all because of you guys. Winny one of the things I do is separate baby yarn and use that for crocheted bears.....it works I am so glad you are doing this.....maybe yu can post pictures when you get done? Anyway....just wonderesd if we could compromise here.....hate to ask Quy for more after all he has done for us....and we aren't even a whole year old yet!!!! Woooohooooo!!! Go TeddyTalkers! Kim Bastaaaaaaa what a darling little bearrrrrrr I love your work! Erin - me too! I have this golly pattern in my head, but so far, more urgent things have kept me from doing it. 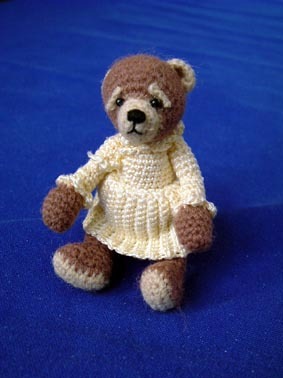 Berta Hesen-Minten has a book on crochet bears, which includes a golly pattern. I haven't made it yet, but it looks cute. 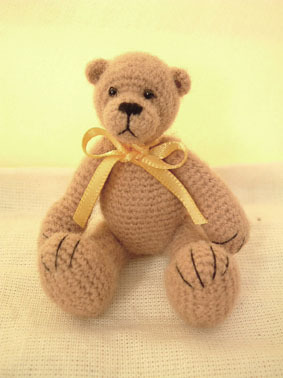 There are lots of people on all levels of experience who make mini bears by crocheting, needle felting and sewing. I don't mean to draw anyone awya from TT though!!! Stay here and if you don't have time to join these groups we can discuss everything here. 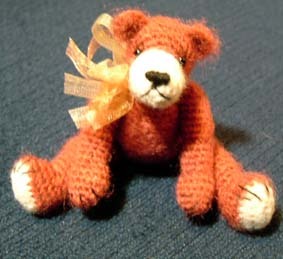 I agree with Dilu, we can keep it in the miniature forum as most crochet critters are quite small. Punch thread is fuzzy acrylic, used for punch embroidery. Deb McCarthy of TedsfromThreads.com sells it in lots of colours and she is a peach to deal with. Other threads can be found at Threadteds.com (Berta's site). Both ladies have very nice patterns too. A Canadian site is Mignonette stitch http://www.mignonettestitch.com/threadbearssupplies.htm by Chantal Giroux. She sells punch thread as well. Lots of patterns can be bought from Edith Molina at http://www.angelfire.com/stars6/threadcrochetbears/ and she sells on ebay. I have more links to artist websites. Keep asking me if you want more. I am just in love with these tiny creations. They are sooo much fun to make and once you get the hang of it there is no limit to your creativity. Let's see some more!!!!! Who's game? Trying to remember here... I do believe that the dark brown parts are made of Flora (an imported crochet cotton.. size 30... her "sweater" is punch thread, and the trim is tatting cotton... probably a size 80.... String jointed. Ok Kim, here it comes. Some crochet bears I made. Yours are adorable btw. Florian is made from Berta's magic thread (unsplit) and my largest chrochet bear so far at about 6 inches. He is a combination of two of Berta's patterns. Mats is made from Deb McCarthy's pattern in punch thread and my halloween roly poly is my own design. I'm on a roll. Here's Nelly from Berta's pattern (punch thread and pearl cotton). Rosie also from Berta's pattern with my own knitted sweater. Rusty again from Berta's pattern book and in punch thread. 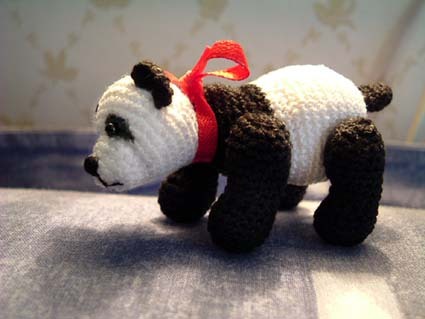 Lin Fang the realistic panda from Berta's in pearl/perle cotton. All somewhere between 2 and 3 inches. You have a real talent for these guys, I can't wait to see more! Wow, Sabine - really, really cute little guys!! What talent you have! WOW!!!!! What a treat I just had.....you guys are fantabulous! Sabine: good renditions- they are adorable. I got Berta's book several months ago and just love it. I agree we can incorporate crocheting and needlefelting.....why not? We have so many tips to share. I made a dilu adaptation of Berta's golly.....there were things I wanted to change. She came out pretty cutely....I am looking forward to trying again. Just catching up around here, and all these little thread guys are making me want to dig out my crochet hook again! They are all cute and huggable! I just love to see the bears!! I couldn't make one to save my life, but you ladies do such great work! Helena, love that bear. The hair-do does it for me!! Helena, gorgeous bear. Looks like you are a pro with crochet bears. Can't believe it was your first and only. I'm not even gonna show my first ones Love the idea with the hair. You should make more. Yayyyyyy Helena!!! Adorable....He'sa giant in personality ! All of you make just adorable bears...I love the bee !!!!!!! and the Magic thread looks just like I want to try ...must order to get it. I've never made a crochet bear before, but I did wonder about the stuffing showing. Maybe someone will know a little better than me. Seems like alot of work to die the stuffing. it is less than $3.00 for 3 oz.....which on little guys like this is enough for a ton of them....I picked up 2 colors and am really happy I did.